The Imperial County Public Health Department Public Information Program is dedicated to providing accurate and useful health information for consumer and partner agencies. Staff is available to respond to media requests for information on public health-related topics. The County of Imperial countinues to experience issues with its phone system. If you need to contact the following programs, please try the main line first, if you are unable to get through, you can try the alternate number. Thank you for your patience. The Imperial County Public Health Department announced that it would be holding community meetings this month to share the results of the 2016/ 2017 California Health Interview Survey (CHIS) with local residents. Local officials will review the results of the data collected and will be available to answer questions from attendees. The meetings will be held in Salton City, Niland and Brawley. The Imperial County Public Health Department announced today the first flu-related death of the 2018-19 flu season. The individual who was in the 60-69 age range, had underlying health issues, and was transferred to a San Diego area hospital and later died. Laboratory testing was positive for the influenza A virus. The individual, according to hospital records, had not received a flu shot this flu season. The Imperial County Public Health Department is providing information regarding the multistate outbreak of E. Coli 0157:H7 infections linked to romaine lettuce. According to the Centers for Disease Control and Prevention (CDC), a total of thirty-two individuals from eleven states have become ill. The illnesses started on dates ranging from Oct. 8, 2018 to Oct. 31, 2018. The CDC is advising consumers not to eat any romaine lettuce because no common grower, supplier, distributor, or brand of romaine lettuce has been identified. No cases have been reported in Imperial County. The Imperial County Public Health Department announced today that it is informing the community of the presence of cyanotoxins in the Salton Sea. In recent months, low levels of cyanobacteria, also known as blue-green algae, were detected blooming along the northern shore of the Salton Sea in Riverside County. Water testing conducted by the California Regional Water Quality Control Board have confirmed the presence of three cyanotoxins: Anatoxin-a, Saxitoxin and Microcystin at the Desert Shores Harbor of the Salton Sea. After continual monitoring of the Niland Geyser, located approximately 5 miles northwest of the township of Niland, over the last couple of months, the geyser has now moved an additional 60 feet to the West of the initial mud pot area. UPRR has moved their trains to the alternate track (Shoofly) which they had constructed as a contingency plan, in the event that the geyser migrated from its original location. The trains are now operating on the alternate track and at a slower pace. As the Operational Area coordinator, Imperial County will be proclaiming an emergency for the mentioned area. The Imperial County Public Health Department, California Highway Patrol, Burlington Coat Factory and First 5 Imperial will join efforts on Saturday, September 29th to provide child safety information to local families during a Child Safety Seat Inspection Event. Certified Child Passenger Safety Technicians from participating agencies will offer car seat inspections and education. Union Pacific Railroad has started the installation work for the Shoo Fly system, a structure that functions as a bypass for a railroad track. Most often these are seen when there are building of structures like grade separations that keep railroad operations intact while construction occurs on the railroad corridor. It’s meant as a temporary structure built to all railroad standards. State Route 111 is open and the trains continue to run on the train track. La compañía de ferrocarril, Union Pacific Railroad ha iniciado la instalacion del sistema de vía temporal (Shoo Fly). La vía temporal es una estructura que funciona como una vía alterna para el tren. Comúnmente estos sistemas se utilizan donde hay estructuras de edificios y mantienen las operaciones del ferrocarril intactas conforme ocurre la construcción en el corredor del ferrocarril. El sistema será una estructura temporal la cual será construida dentro de todas las normas del ferrocarril. La instalacion de la via sera en el lado oeste de la vía actual. La carretera estatal 111 sigue abierta y los trenes siguen corriendo en las vías actuales. Union Pacific Railroad has reported that it ordered a second rig for a second well. There’s no timeline at this point of when that work will start. The lining of the first well is almost complete. Union Pacific will also start bringing material and start preparing for the installation of a Shoo Fly that will be used as a last resort if the water gets past the sheet pile. A Shoo Fly is a structure that functions as a bypass for a railroad track. Most often these are seen when there are building of structures like grade separations that keep railroad operations intact while construction occurs on the railroad corridor. It’s meant as a temporary structure which is built to all railroad standards. The plan is to install the Shoo Fly west of the current track. Currently, State Route 111 is open and the trains continue to run on the train track. La compañía de ferrocarril, Union Pacific Railroad ha reportado que ordenó un segundo sistema para un segundo pozo de agua subterráneo. En este momento se desconoce cuándo iniciara la obra de trabajo en el segundo pozo. El revestimiento del primer pozo ya casi está terminado. Además, Union Pacific iniciara el traslado de material y el trabajo para la instalación de un sistema de vía temporal (Shoo Fly) la cual se usara como último recurso si el agua llegase a pasar la barrera anteriormente instalada. La vía temporal es una estructura que funciona como una vía alterna para el tren. Comúnmente se utilizan donde hay estructuras de edificios y mantienen las operaciones del ferrocarril intactas conforme ocurre la construcción en el corredor del ferrocarril. Este sistema será una estructura temporal la cual será construida dentro de todas las normas del ferrocarril. El plan es instalar la vía en el lado oeste de la vía actual. La carretera estatal 111 sigue abierta y los trenes siguen corriendo en las vías actuales. Yesterday afternoon, as work continued at the geyser, a pressure pocket was encountered. This resulted in some drilling mud mixture being discharged into the Niland Lateral drain and clean-up measures were quickly put in place. The State Waterboard and Imperial Irrigation District were notified of the discharge. Union Pacific Railroad has ceased work at the site until equipment is cleaned and reset. The site is being evaluated for the need for different drilling equipment to continue the work. A hazardous materials team has been on site since Thursday continuously monitoring air quality. Carbon dioxide (CO2) levels in the area continue to fluctuate, at times to unsafe levels, however there is no danger outside the immediate work site. La tarde de ayer, conforme continuaba la obra de trabajo en el geiser, fue encontrada un bolsillo de presión. Esto resulto en que agua y lodo entrara al Desagüe Niland Lateral y se iniciaron medidas de limpieza de manera inmediata. La Mesa Directiva Estatal de Agua (State Waterboard) y el Distrito de Irrigación de Imperial (IID) fueron notificados de lo sucedido. El ferrocarril Union Pacific ha cesado los esfuerzos laborales en el sitio hasta que el equipo sea limpiado y reajustado. El sitio además está siendo evaluado para ver si será necesario adquirir diferente equipo para continuar. Un equipo especializado en materiales peligrosos ha estado presente en el lugar desde el jueves para monitorear la calidad de aire de manera constante. Los niveles de monoxido de carbono en el área continúan fluctuando, en tiempos a niveles peligrosos, sin embargo no existe peligro fuera del lugar de la obra. The County of Imperial made an emergency declaration this morning due to a geyser that is migrating toward and threatening the Union Pacific Railroad (UPRR) railroad tracks, SR -111, and buried utilities in the area north of Niland. The declaration by the Board of Supervisors will assure that the efforts are expedited so that the geyser does not affect critical transportation and utility infrastructure. Union Pacific Railroad is the entity leading the effort to mitigate the situation by moving the fluid out of the area and is working closely with officials from the County of Imperial, Cal OES, CalTrans, and the Colorado River Basin Regional Water Quality Control Board. Please note that official updated information related to this situation will be provided on the Imperial County Emergency Medical Services (EMS) Agency’s Facebook page. The Imperial County Public Health Department is notifying the public that there has been another discharge of untreated sewage into the New River. The discharge occurred yesterday, June 6, 2018. The amount of the discharge is unknown at this time. This is the first discharge of untreated sewage into the New River this year. The discharge was due to a pump failure and has since been fixed. This is a reminder to the public that the New River continues to pose a threat to our environment, our communities, and the people whose work may bring them in contact with the river. The County of Imperial is working closely with federal and state regulators to cooperatively address the sewage issues in Mexicali that continue to impact the New River. The Imperial County Public Health Department is providing additional information regarding the multistate outbreak of E. Coli 0157:H7 infections that have been linked to romaine lettuce. According to the U.S. Food and Drug Administration (FDA), a total of ninety-four individuals from twenty-two states have become ill. The most recent illness started on April 12, 2018. In California there have been four cases detected in Alameda, Berkeley, Fresno, and Orange. No cases have been reported in Imperial County. Information collected to date indicates that the romaine lettuce is from the Yuma, Arizona area. The California Department of Public Health (CDPH) and the California Department of Pesticide Regulation (DPR) today warned people not to eat cactus pads, or nopales, imported from Mexico sold at specific retail and wholesale locations around the state due to the presence of unapproved pesticides. A tool for public health and planning will give local communities an edge to build resilience to a warming climate. A Climate and Health Profile Report (CHPR) was prepared by the California Department of Public Health for Imperial County to highlight the predicted future climate conditions and related effects on health. The City of Calexico is participating in the California Statewide Medical and Health Exercise (SWMHE) today at the downtown area of the City and Calexico Mission School from 9:00am – 12:00 pm. This functional exercise, based on a multi-site coordinated emergency, will help the community and State to be better prepared for emergencies and incidents of all types and sizes. This is an exercise and not an actual event. The Imperial County Public Health Department has received confirmation of three cases of West Nile virus in local residents. Two cases were identified as neuroinvasive illness, the most severe form of West Nile virus (WNV). The onset of symptoms for the three cases occurred from mid-July through late August. The Imperial County Public Health Department announced today that the California Health Interview Survey will be administered in Imperial County once again this year. The California Health Interview Survey, or CHIS, is a telephone survey conducted annually on various health topics. The survey interviews households throughout California. It was first conducted in 2001 and is the largest of its kind in the nation. Danila Vargas, has been named the Interim Director for the Imperial County Public Health Department after Department Director, Robin Hodgkin was named Interim CEO by the Imperial County Board of Supervisors this morning. The Imperial County Asthma Community Linkages Project Request for Proposal (RFP) is modified as set forth in this Addendum. The original RFP documents remain in full force and effect, except as modified by this Addendum, which is hereby made part of this RFP. Respondent shall take this Addendum into consideration when preparing and submitting required documents. Appeals or objections to a rejection or award under this process must be submitted in writing within 5 business days of the postmarked notice of award or rejection. Such an appeal or objection must be specific, identifying the nature of the protest or objection, and stating all of the facts that form the basis for the appeal. You must also specify the reason(s) for the appeal or objection citing law, rule, regulation or procedures upon which the appeal is based. Any appeal or objection must be forwarded to the Imperial County Purchasing Department by certified or registered mail or delivered in person, with the applicant obtaining a receipt of delivery. The Imperial County Asthma Community Linkages Project Request for Proposal (RFP) is modified as set forth in this Addendum. The original RFP documents remain in full force and effect, except as modified by this Addendum, which is hereby made part of this RFP. Respondent shall take this Addendum into consideration when preparing and submitting its additional information as required. The Imperial County Asthma Community Linkages Project Request for Proposal (RFP) is modified as set forth in this Addendum. The original RFP documents remain in full force and effect, except as modified by this Addendum, which is hereby made part of this RFP. Respondent shall take this Addendum into consideration when preparing and submitting its proposal. El Centro, CA – Retail stores play a vital role in keeping communities and people healthy and our economy strong. The Healthy Stores for a Healthy Community survey provides information about the availability and marketing of healthy and unhealthy products in our local stores, and it is an important way to understand what consumers face – young and old- in the retail environment. The Imperial County Public Health Department, Emergency Medical Services (EMS) Agency joined the El Centro Fire Department and the California Highway Patrol (CHP) this morning to warn local residents about the dangers of heatstroke. According to the National Highway Traffic Safety Administration (NHTSA), heatstroke is the number one killer of children, outside of car crashes. That’s why local agencies have joined efforts to attempt to reduce these deaths by reminding parents and caregivers about the dangers of heatstroke and leaving children in hot cars. The Imperial County Public Health Department is notifying the public that there has been another discharge of untreated sewage into the New River. The amount of the discharge is 600l/s and started at 4:00am today, Thursday March 16, 2017. This is the third discharge of untreated sewage into the New River this year. This is a reminder to the public that the New River continues to pose a threat to our environment, our communities, and the people whose work may bring them in contact with the river. The County of Imperial is working closely with federal and state regulators to cooperatively address the sewage issues in Mexicali that continue to impact the New River. Colorado River Basin Regional Water Quality Control Board. The Imperial County Public Health Department is urging boaters and recreational users to avoid direct contact with or use of waters containing blue-green algae (cyanobacteria) in the Salton Sea. A low level of cyanobacteria, also known as blue-green algae, has been detected blooming along the northern shore of the Salton Sea in Riverside County. On November 29, 2016, the federal government issued a rule banning smoking in all public housing units nationwide, extending a smoke-free environment to nearly a million units. Public housing agencies will have 18 months to bring their buildings into compliance. “Every child deserves to grow up in a safe, healthy home free from harmful second-hand cigarette smoke”, said Housing Urban Development Secretary Julian Castro. The Imperial County Public Health Department’s Animal Control office has announced the schedule for the upcoming low-cost Rabies Vaccination Clinics for 2016-2017. Imperial County Animal Control has been conducting Rabies Vaccination Clinics in Imperial County for over 46 years. The clinics are scheduled from November 5, 2016 through February 26, 2017, at various locations throughout Imperial County. Last year, more than 2,000 county dogs were vaccinated and licensed at clinics offered by Imperial County Animal Control. The California Highway Patrol, Burlington Coat Factory, Imperial County Children & Families First Commission and the Imperial County Public Health Department will join efforts on Saturday September 24th to provide child safety information to local families during the Child Safety Seat Inspection Event . Certified Child Passenger Safety Technicians from partnering agencies will be offering car seat inspections and education at no cost to parents and caregivers beginning at 7:30 am in front of Burlington Coat Factory in El Centro. California Department of Public (CDPH) Director and State Public Health Officer Dr. Karen Smith announced today that California has surpassed a key goal of the National HIV/AIDS Strategy. CDPH data released today indicate that 91 percent of Californians living with HIV in 2014 had been diagnosed. California reaches this benchmark six years ahead of the timeframe set by the National HIV/AIDS Strategy, which is to ensure that 90 percent of people living with HIV are diagnosed by 2020. The Strategy was developed by the White House to guide a collective national response to the HIV epidemic. California Department of Public Health (CDPH) Director and State Public Health Officer Dr. Karen Smith today issued a health advisory related to an outbreak of invasive meningococcal disease occurring in Southern California, primarily among adult gay and bisexual men. Meningococcal disease is caused by the bacteria Neisseria meningitis and can cause meningitis and bloodstream infections (sepsis). Although rare, meningococcal disease is serious and potentially fatal. Effective today, the minimum age of sale for tobacco products in California increases from 18 to 21, and for the first time e-cigarettes are added to the existing definition of tobacco products. California is the second state in the nation, following Hawaii, to raise the minimum age for tobacco sales to 21. “Today marks a significant moment in California history as new tobacco control laws go into effect statewide. This is the first time the Golden State has raised the age of sale for tobacco since the law first took effect 144 years ago,” said Dr. Karen Smith, California Department of Public Health (CDPH) director and state health officer. The Imperial County Public Health Department, Emergency Medical Services (EMS) Agency joined the El Centro Fire Department and the California Highway Patrol this morning to warn local residents about the dangers of heatstroke. According to the National Highway Traffic Safety Administration (NHTSA), heatstroke is the number one killer of children, outside of car crashes. That’s why local agencies have joined efforts to attempt to reduce these deaths by reminding parents and caregivers about the dangers of heatstroke and leaving children in hot cars. Imperial County Public Health Department’s Epidemiology Program alerted local healthcare providers this week about drug overdoses and deaths believed to be associated with consumption of an illicitly obtained opioid drug reported in several jurisdictions in California over the past two weeks. Health officials suspect that the overdoses and deaths are linked to a drug that strongly resembles the prescription opioid drug Norco, but actually contained an undetermined amount of fentanyl, a powerful synthetic opiate analgesic more potent than morphine. No suspect or confirmed cases have been reported to date in Imperial County. Department of Public Health (CDPH) Director and State Public Health Officer Dr. Karen Smith today advised that although there is no evidence of mosquitoes carrying Zika virus in California, people should always take steps to avoid mosquito bites, including removing standing water and wearing insect repellant when necessary. The County of Imperial wishes to inform the public and interested applicants that the Imperial County Asthma Linkages Project Request for Proposals (RFP) Applicant Assistance Workshop previously scheduled for tomorrow, January 14, 2016, has been postponed. As a result, the County will also revise the application due date, which has yet to be determined. The new due date will be announced once it becomes available. The California Health and Human Services Agency (CHHS) and the California Department of Public Health (CDPH) today announced 23 community-based health innovations that advance the Let’s Get Healthy California effort to make California the nation’s healthiest state by 2022. These innovations will be recognized and discussed as part of an Innovation Conference in Sacramento on January 26, 2016. California Department of Public Health (CDPH) Director and State Public Health Officer Dr. Karen Smith today announced that California is experiencing an increase in norovirus cases, commonly referred to as stomach flu or winter vomiting disease. CDPH has confirmed 32 outbreaks of norovirus in California since Oct. 1, 2015 – likely resulting in hundreds of reported sicknesses in the state. These outbreaks far exceed the number reported at this time in 2014. California Department of Public Health (CDPH) Director and State Public Health Officer Dr. Karen Smith is urging Californians to protect themselves against mosquito bites if traveling to Mexico or Latin America, where there have been increased reports of the mosquito-borne diseases chikungunya and dengue. Travelers should also be aware that there is currently transmission of dengue on the Big Island in Hawaii, and precautions against mosquito bites are advised; there are no reports of dengue transmission on the other Hawaiian islands. California Department of Public Health (CDPH) Director and State Public Health Officer Dr. Karen Smith today warned consumers about the risks associated with wearing decorative contact lenses without proper consultation with an eye care professional. Decorative contact lenses are lenses that do not correct vision and are intended to temporarily change the appearance of the eye. Use of these lenses can carry serious risks, including permanent eye injury that may lead to blindness. California Department of Public Health (CDPH) Director and State Public Health Officer Dr. Karen Smith today announced the results of a CDPH study that shows additional benefits of prenatal pertussis vaccination. Vaccination of pregnant women against pertussis (whooping cough) has been found to prevent whooping cough in their infants, however, no vaccine is 100 percent effective and some infants of vaccinated women develop pertussis. California Department of Public Health (CDPH) Director and State Public Health Officer Dr. Karen Smith announced today that a survey has found that the California rate of illegal tobacco sales to minors has decreased. According to the 2015 Youth Tobacco Purchase Survey, illegal tobacco sales to minors at retail outlets occurred at a rate of 7.6 percent, compared to last year’s rate of 9 percent. California Department of Public Health (CDPH) Director and State Public Health Officer Dr. Karen Smith is warning Californians to protect themselves from two invasive mosquito species recently found in California. Both species can transmit infectious diseases, such as dengue fever, chikungunya, and yellow fever. This warning comes as two more counties are added to the list of counties where Aedes aegypti (the yellow fever mosquito) and Aedes albopictus (the Asian tiger mosquito) have been detected. The Imperial County Public Health Department announced today that it would start administering flu shots on Wednesday October 7th to individuals six months and older. The Department will host a flu clinic at the Department’s Training Center from 8:00 am – noon. Walk-ins for the flu shot will start on Thursday October 8th. Flu shots for seniors will begin Thursday October 1st at regularly scheduled Senior Clinics throughout Imperial County. This year’s flu vaccine will protect against seasonal flu. The cost for receiving the flu shot will be $5.00. The Imperial County Public Health Department, U.S. Border Patrol, California Highway Patrol, Imperial County Children & Families First Commission and the Office of Senator Ben Hueso will join Burlington Coat Factory this Saturday to bring child safety information to local families during the Child Safety Awareness Day event. 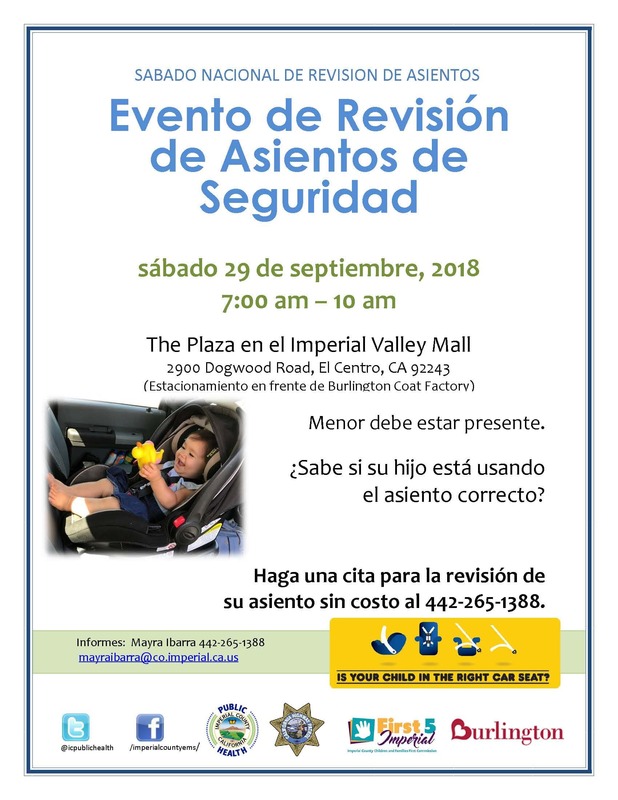 Certified Child Passenger Safety Technicians from partnering agencies will be offering car seat inspections and education at no cost to parents and caregivers on Saturday, September 19, beginning at 8:00 am in front of Burlington Coat Factory in El Centro. California Department of Public Health (CDPH) Director and State Health Officer Dr. Karen Smith is encouraging health care providers and others to consider measles in persons with rash and fever. “Measles continues to circulate in much of the world outside of North and South America, but with Californians returning from trips abroad and tourists from other countries visiting California, we are reminding health care providers to keep measles in mind when they see patients with symptoms of the disease,” Dr. Smith said. California Department of Public Health (CDPH) Director and State Health Officer Dr. Karen Smith announced that the department has been notified of a presumptive positive case of plague contracted by a recent visitor to California from Georgia. Confirmatory testing is being conducted by the Centers for Disease Control and Prevention (CDC). Prior to becoming ill, the patient had been vacationing in Yosemite National Park (Yosemite), the Sierra National Forest and surrounding areas in California in early August. CDPH is in contact with Yosemite, CDC and the National Forest Service to assess locations where the patient visited. The California Health and Human Services Agency (CHHS) and the California Department of Public Health (CDPH) today announced the Let’s Get Healthy California “Innovation Challenge” to engage and empower people to work together toward improving the health of their community and the state.